Sometimes, it accumulates and forms big balls, but it often tends to stick to the carpet and move further down every single day. Yes, we’re talking about pet hair. It should be removed in a timely manner to protect the pile from damage and to lower the risk of allergies among the people living in the house. Inspection is the first stage of the process. It reveals the condition of the carpet and the specific problems which it has from hair accumulation to stains and even mold. The goal of deep cleaning is to eliminate all of them in a gentle and safe way. 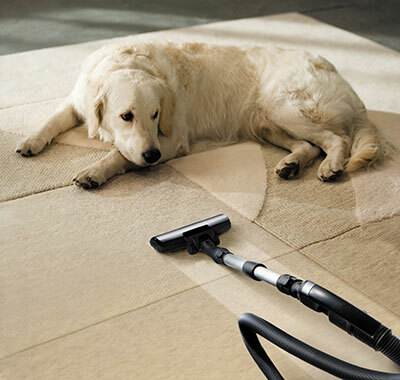 The pet hairs and dandruff are extracted from the lowest levels of the pile along with dust and dirt. This is achieved with the help of special techniques and equipment. The carpet becomes fresh, soft and bright once again. There are no traces of odor whatsoever. A great amount of pet hair sticks to the sofa, armchairs and other sitting furniture, especially if the pet likes to nap on them, which is quite common. The key to success is to remove the hair even from the tightest corners of the furniture pieces. Deep cleaning will eliminate pet dandruff, dust, dirt and even chemical compounds that have gotten stuck between the delicate fibers such as tobacco tar. It works effectively for odor removal, and softness and color restoration. While we all love pets, we have to admit that they leave stains in addition to shedding hair. The sooner these are removed the better. Otherwise, they may damage the carpet. The goal is to extract all compounds causing damage, odor and discoloration. This is possible only with the use of gentle yet powerful equipment and potent products, which are safe for people, pets, carpets and the environment, too. Wondering how to go about pet hair cleaning? Leave the work to us to get a professional result in a short time. We clean carpets, upholstery and rugs of all kinds. Count on us at “Carpet Cleaning La Crescenta” to remove stains and odor completely. Call us or send a note to hire us. Check out our website for more details on our company and services.